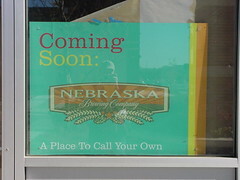 When I first heard about Nebraska Brewing Company opening in Papillion, I had serious doubts about the place. I've been to too many "brewery-restaurants" that seem to wade in the mediocrity pool and rarely impress. I had doubts until I met Paul Kavulak, principal owner of Nebraska Brewing Company. Paul is a man after my own heart. An information technology professional with a thing for history and beer. And as I found out, a bit of an obsessive fanatic like myself. He doesn't just like beer; he's been home brewing for 15 years. In 1992, a co-worker introduced him to the craft and just a year later he entered his first competition with a Scotch Ale and won a People's Choice award. Paul was one of the original members of the OmaHops Homebrew Club and was the club Secretary for awhile. So this isn't just someone thinking a brew pub could make them a lot of money, this is someone who *really* loves beer. This also isn't just someone who loves beer who happened to one day think "Man it would be cool to own a brewery". This has been a flame in the back of his mind for at least 10 years. As a matter of fact, Kavulak and some of his OmaHops friends were to be the owners of the Jones Street Brewery when it closed, only to be thwarted by a last minute change in the terms that didn't agree with his analytical mind [CORRECTION: The other people involved with the attempted purchase were Dean Dobmeier (the brewer at Jones Street Brewery) and Bill Baburek (Cresent Moon)] . That logic-over-passion thought process is yet another reason I am excited for this place to open. The research and planning that has gone into this opening is impressive to say the least. It won't guarantee success, but it certainly helps. Finally, you may have asked yourself "Does Omaha need another brew pub?" While I've always thought there was room for another brewery in Omaha, I never really felt there was a need for one. After talking with Paul, I did realize that there are a few spots in Omaha the do NEED one, including Papillion. The next question is, how will NBC be different? I found the answer to this very interesting. One of the reasons Kavulak stopped competing was because he always brewed beer for his own tastes which meant that sometimes a Porter or Lager he brewed wouldn't fit within the "style guidelines" for that particular brew, thus big point deductions which kill your chances to really compete. A perfect example of that is when he entered the same Scotch Ale that won the People's Choice award into a different competition only to have it score poorly due to the 12% ABV - far outside the upper range of 10% for even the strongest Scotch Ales according to the judging guidelines. Showings like this took some of the fun out of competing, so he decided to stop and just brew what he loves. He will strive to keep that philosophy while trying to find that delicate balance with broad appeal. I also found it interesting that Kavulak, being the history buff he is, wants to bring back some of Nebraska's rich brewing tradition which was wiped out for the most part during the prohibition. I believe Omaha has room for a brewery like this. So I bid an early welcome to the Nebraska Brewing Company.